heel mooi dit moet haast wel stimulerend werken. These sculptures are lovely and serene, and the quote is spot on. These are wonderful sculptures! Love the quote too. I love libraries too, and I hope future generations will always see their importance (no matter how many ebooks replace real ones). I recently drove by an intersection that has about 12 large metal eagles on display... I definitely need to check out their significance! 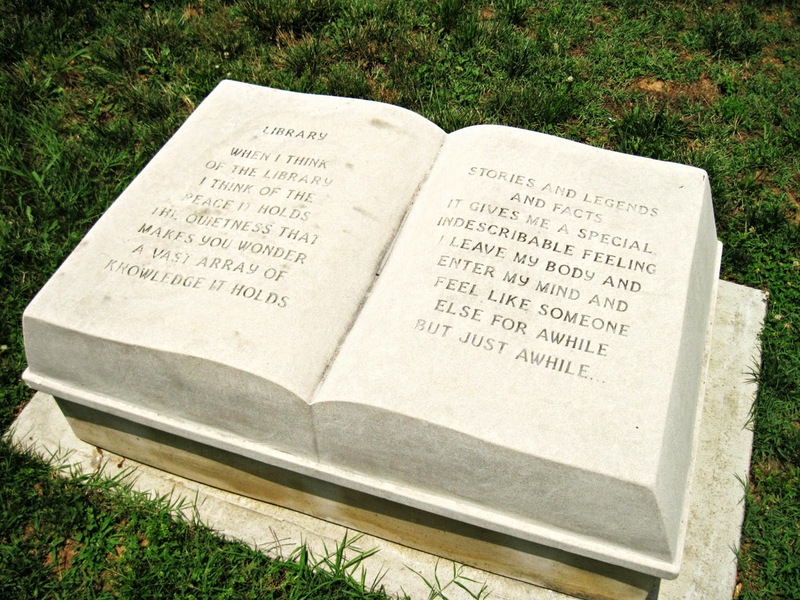 Thanks for sharing this library tribute. Very nice sculptures. The quote is great. Summer, especially, reminds me of visiting the library when I was a kid. I love libraries, as you probably already know. 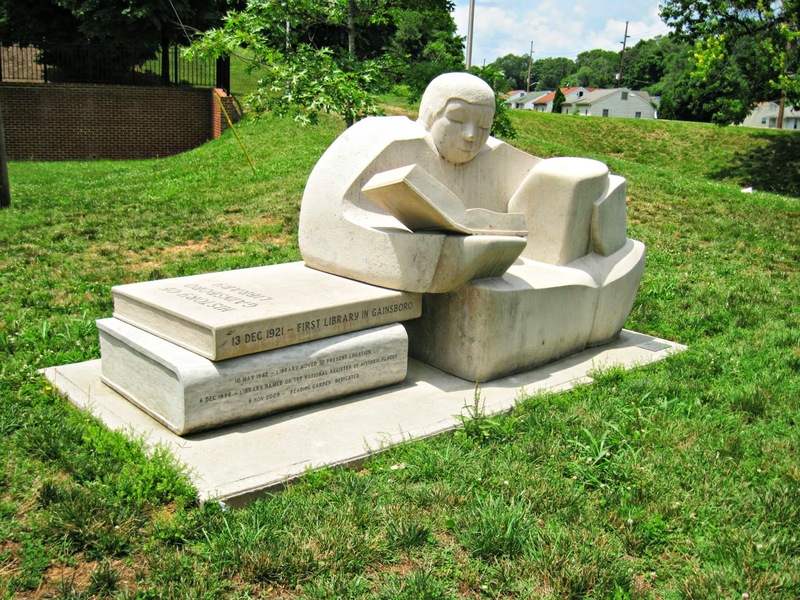 These sculptures are lovely--I especially like the one with the pile of books. There are several landmarks in the area that I want to see. Can you believe I've never been to the D-day Memorial, and I'm so close? That is a great way to celebrate reading. How cool is that!!! I love it. Unusual style, modern looking, and very cool. I love the books, and the inscription inside the book. If I could find out about any good sculptures nearby, I would be THERE! They are the perfect snapping subject as they never move and are unaffected by the wind. Those are just amazing. Done by a book-loving creator, and ideal for a library. Where would we be without libraries? Sometimes I go to the county Confederate Memorial Park. It's cool and shady, and it has a big plinth with an eagle on top. All the names of the county men who died in the Confederate Army are carved on it. Those are cool statues and make a bold statement. I love libraries too and relate to the quote very much. How Interesting, I would have had to go back and take a look too. Those are terrific sculptures... Like you said, they are so serene... NEAT!! 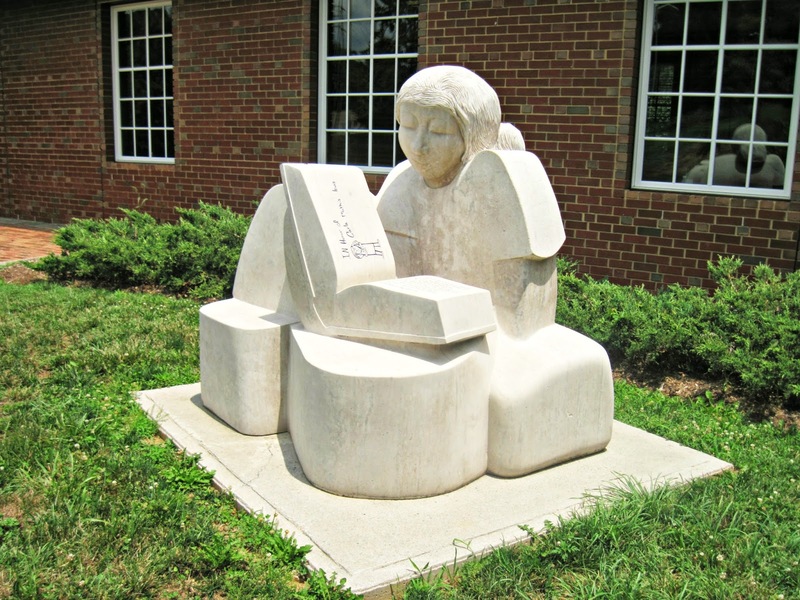 The sculptures make everyone want to read some books. Really encoraging. Those are so cool! I would definitely stop to check them out! Nice peaceful sculptures! They invite your to do something quiet, like reading. That's really awesome that you went back later. I'm not sure I would have but maybe I will have to start in the future if I see something that looks neat! I have a reminder for a post on a great fountain sculpture that I need to remember to write. It is amazing the beauty that we can see if we just look around. I hope your weekend went well Lisa.